Skippyjon Jones fans will go loco over this brand new matching game format! 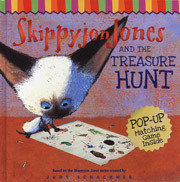 Skippyjon Jones has found a treasure map, and you can help find the treasure by flipping over the correct bilingual tiles in the pop-up matching game included with the book. This book is fun for parents and kids to read aloud and play together, and will help teach little ones tricks of memorization. Book includes a popup match game with 12 bilingual spinning tiles!